Bagalamukhi is one of the ten mahavidyas (great wisdom goddesses) in Hinduism. Bagalamukhi Devi smashes the devotee’s misconceptions and delusions (or the devotee’s enemies) with her cudgel. She is also known as Pitambara Maa in North India. In Datiya District of Madhya Pradesh in 1935 Santa Shree Swami had established Pitambra Shakti Peeth. In India, there is popular belief that, to defeat others in legal dispute or election, they need to get the blessings of Ma Pitambra. For Bagalamukhi Sadhana, you don’t need to visit the temple. It is better to perform Sadhana under a knowledgeable Guru but, if nobody is around, you can also perform it on your own. Just, make sure that you don’t do any mistakes. The “Bija Mantra” of Ma Baglamukhi is “Hlreem” (ह्रिं). If you have never done Bagalamukhi Sadhana before then, you should start your Sadhana from this bija mantra. Bija Mantra is chanted on a Haldi (turmeric ) Mala rosary 0f 108 beads. The mantra can be repeated one time, 5 times, 11 times, 21 times or more times. This bija mantra of protects you from evil powers. This mantra can protect you from people who want to harm you, protect from false court cases and other problems. 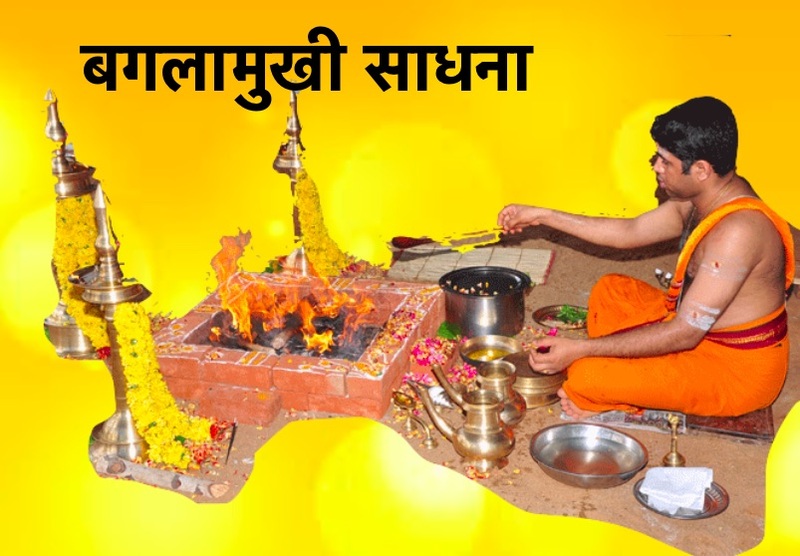 Bagalamukhi Sadhana is performed for better result to the problems. Bagalamukhi Sadhana is done at night between 9 PM and the midnight. Bagalamukhi likes yellow colour. So, wear yellow coloured dress, sit on yellow seat and use yellow coloured pooja materials. Face East wile performing pooja. Have a image of Bagalamukhi in front of you. Burn an incense, light a candle in front of the image of Bagalamukhi. Take a Sankalpa (a pledge or solemn vow) – Detailed format of Sankalpa is given below. After Sankalpa, you should read chant the Bagalamukhi mantra, counting by a turmeric beads rosary 0f 108 beads, 11 times a day. (Although I suggest 11 repetitions on the Mala, the repetitions are usually done one, 5, 11, 21, 31 and so on times as desired.) The Mantra is given below. At the end of the sadhana, Mritunjaya mantra “Haun Joo sah” (हौं जू स:) should be chanted 10 times. The Sankalpa is a pledge you make to the goddess Bagalamukhi. There is not a single format but you can take the following text as a guideline of how to prepare your own, personal Sankalpa. Previous Post:How Bagalamukhi Maa helps us in problems? I m facing problem in love . The one who even loved me is getting ready to marry someone else. I lost my job recently. My family left me. I married someone n faced problem n came out of it. I want to marry the one I loved. But he stopped talking to me now.